you really can't use or are uncomfortable with is not good. Look carefully, choose carefully, and take time. It's a big investment." ~ Ronald Jones, "Buying an RV? Think Differently!" We've been searching off and on for a new RV for the last couple of years but for various reasons, weren't sufficiently motivated until recently to replace our old NuWa HitchHiker II 5th-wheel camper. The HitchHiker has been well-loved but too well-lived-in. It was not built for the use we've given it the last 6½ years. All but a couple manufacturers build "fivers" for people who use them for a week or two at a time, not as much as we do. When we bought it we had no idea we'd love traveling in it so much. We've definitely gotten our money's worth out of it! We've also been doggone lucky that one of the major systems or appliances (HVAC, plumbing, electrical, refrigerator, water heater, etc.) hasn't self-destructed yet. We've never had warranty issues that were serious enough to return it to a NuWa dealer; Jim was able to fix any relatively minor problems with it, like installing a new door lock, reinforcing the dining chairs, and repairing plumbing leaks. We never did figure out where all the screws came from that worked their way loose in the first few months! We had only one recall (the Dometic refrigerator) and the authorized repairman came to us to fix it at no charge. But the thought has always been in the back of our minds as the HitchHiker ages that any of those systems or major appliances could break and cost a lot of $$$ to repair. We are long out of warranty and never got an extended warranty on it which, in this case, was a good decision in hind sight. We have had some "incidents" with the HitchHiker, mostly during the AT Adventure Run when Jim was under a lot of pressure to move the camper on up the Trail every couple days. There is damage to the exterior in several places but with a $500 insurance deductible, we were always reluctant to have professional repairs done. Everything is functional but the dings are still there and the roof is still patched. We've had numerous discussions about whether to spend several thousand dollars to get those repairs done, replace the worn carpets, upgrade the windows, replace peeling wallpaper borders, modernize the interior, buy new tires (need them soon), and make other improvements so we'd be happier living in the camper for another few years. We kept putting those things off, however, and the HitchHiker has just become increasingly worn out and uncomfortable. It only LOOKS warmer than 10°F. at Bandera on race morning. We realized just how uncomfortable it could be during the 10°F. temperatures we endured at Bandera earlier in the month (above) and then the monsoon a couple weeks ago at Fort Sam. Those two incidents helped solidify our decision that *now* is the time to buy a new RV. We had already planned to intensify our search when we got back to Texas. There are numerous RV dealers in the state and they don't have to deal with the goofy laws pertaining to out-of-state buyers that Arizona dealers do. We had a smooth buying experience in Texas last February when we got our Dodge Ram, so why not make a major purchase in Texas again? We plan to be here until March, giving us plenty of time to hunt for a new RV. For readers who aren't real familiar with the various types of RVs, here are links to two different web pages that describe and illustrate each type. 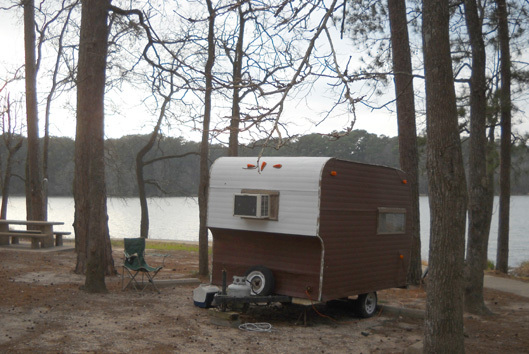 Briefly, an RV (recreational vehicle) is a motorized or towable vehicle with living accommodations -- at least a bed -- for recreation and camping. The seven diagrams here are from the second link. Motorhomes, which combine a motor vehicle chassis and living quarters in one unit, include Class A, B, and C rigs. Full-timers often choose a Class A or C motorhome (L-R in diagrams below) for their convenience, features, and interior space. They tend to be the most expensive RVs. Note that the Class B van in the middle is too large in proportion to the Class A on the left and Class C on the right. Some Class As are over 40 feet long. 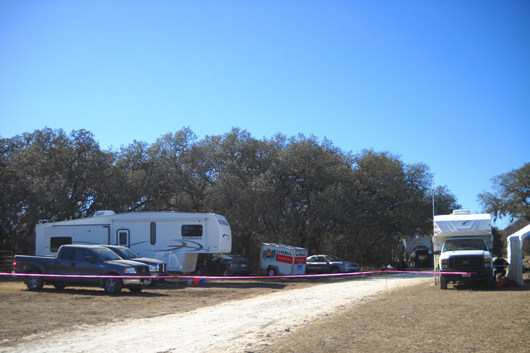 Towable RVs include travel trailers, fifth-wheel trailers (which I also call "5th-wheels" and "fivers"), pop-ups/folding campers, and truck campers, also shown L-R below. Depending on size, travel trailers and pop-ups can be pulled by a truck, SUV, van, car, or even a motorcycle. You need a pick-up truck to haul a 5th-wheel or truck camper. Many full-timers travel with 5th-wheels; they come in a wide range of sizes, prices, and quality. Between the two of us, Jim and I have previously owned at least half a dozen pop-up campers, travel trailers, and 5th-wheels. We don't claim to be RV experts by any stretch of the imagination but we've learned a lot about them over the years -- and we learned even more in recent weeks. Buying the right RV, especially one you plan to live in most or all of the time, is more complicated than buying a vehicle; in some ways it's more like buying a stick-built house. You don't just park it when you get home. You ARE home! Throughout the entire process of hunting for a new RV Jim and I have pretty much been of like mind about what we want. We determined last winter -- before we bought the new Ram truck -- that we would replace the HitchHiker with another 5th-wheel. We like Class C motorhomes but they aren't as practical for us. For flexibility we'd need to haul a tow vehicle behind it to use for transportation when camping in one spot for several days or weeks. Our other motor vehicle, a front-wheel drive Honda Odyssey van, isn't good "toad" material; for us to tow it behind a motorhome, we'd have to buy a trailer for it to ride on. Those aren't cheap. Neither is any type of motorhome or buying a different "toad!" Although a 5th-wheel requires more work each time we move to a different campsite, we think this type of rig offers the most living and storage space for the buck. We're used to the drill and Jim doesn't mind the extra work. It also helps that we discovered a new technology that makes settling in at a new site much easier on him -- hydraulic self-leveling systems. More about that in the next entry. 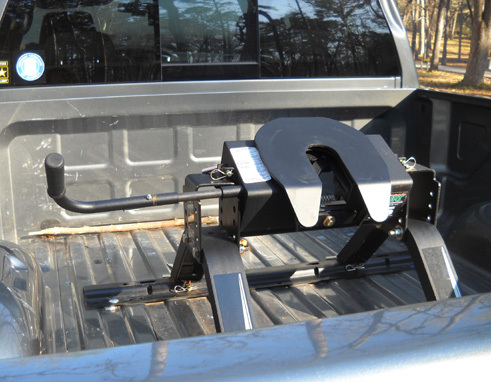 The pin slides into the hitch in the bed of the truck, effectively distributing more of the weight of the camper to the center of the truck instead of all of it being behind the bumper (see next photo, farther below). Most new 5th-wheels are ergonomically designed in the front to allow a decent turning radius even with a short-bed truck like we now have. One of our goals was to find a model with a tighter turning radius than we have with the HitchHiker. We've already smacked the back of the cab once and don't want to knock out the window next time! You can see the indentation at the top right of the photo below. Fifth-wheels have some advantages over travel trailers, which attach to the truck bumper and don't hover over the bed of the truck. It's true that a travel trailer won't hit the back of the cab if you turn too sharply but the driver has more control when towing a 5th-wheel; in our opinion a fiver handles better, doesn't sway as much, and is easier to back up than a travel trailer of similar length. Another (minor) selling point for us was already having a 5th-wheel hitch, although, as you'll see, that became a moot point. So there wasn't any question about which type of RV to get or even how large we wanted it to be. We have to be able to pull it with our existing truck. 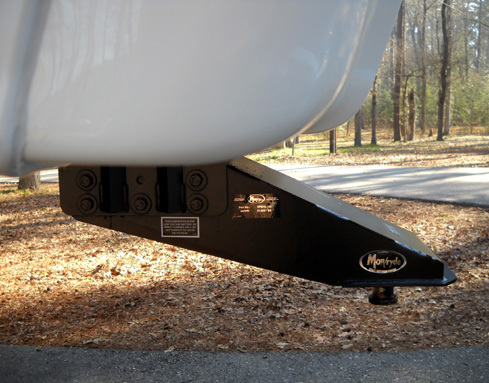 Camper weight was a critical factor and that limited our selection to some extent. We were on the same page in every regard, from length to sturdiness to desired features to acceptable floor plans to decor. We also knew we wanted a 5th-wheel of equal or better quality than the HitchHiker, which is considered better than average but not top of the line. For various reasons we never considered buying a used RV or even a new 2008. Yup, in this recession there are still a few '08s available and plenty of '09s, too. The 2010 models have been coming off the line since the middle of 2009 so there are more of them available, although the selection of every year and brand is smaller now than several years ago. We realized we could get a better deal on a new 2009 model that'd been sitting on the lot for a while than a newer 2010 model, so we looked at both years. We still had a lot of legwork to do. The search became our full-time job for the next couple of weeks. That's my main excuse for being behind on this web journal again. That and being too wordy, of course! Although we'd already done a lot of internet research, we still hadn't zeroed in on the specific manufacturer or models that would be suitable for us until one of the salesmen at a dealership in the greater San Antonio area, bless him, remarked that the brands and models we were considering at the time, like Montanas, Grand Junctions, Cardinals, Bighorns, and Cedar Creeks, weren't warranted for full-time use. Yikes! That was something we really hadn't sufficiently considered yet, and it greatly narrowed our focus. That was a Good Thing in our case. It makes a lot of sense: if a company is willing to warrant an RV for full-time use, you gotta think it's built more sturdily than the brands that are warranted for only one year -- and specifically will not cover you if they find out you're full-timing in their coaches! If someone intends to live in an RV all or most of the time, it had better be built for heavy use and perhaps a lot of travel miles, although some full-timers we know don't travel very far, preferring to stay in one state or geographical area and move around infrequently. This is how dealers sometimes move around the 5th-wheels on their lots! Before we discovered that some 5th-wheel manufacturers deliberately build these things for full-time use we figured we'd get something of comparable or better quality than the HitchHiker and just trade it in five to seven years when it starts to wear out, like we did with the HitchHiker (planned obsolescence). Heck, in five years we might not even want to travel around so much any more. But this new information changed our perspective. We may still trade up or out of the RV lifestyle in five to seven years, but at least a sturdier 5th-wheel should be more comfortable during that time and in better shape than the HitchHiker after 6½ years of heavy use. Most companies warrant their 5th-wheels for only one year. The only two U.S. companies we've found that build and warrant all of their 5th-wheels for full-timers are DRV, formerly called Doubletree RV, and Carriage, Inc. DRV warrants its coaches for three years, Carriage for two years bumper-to-bumper and five years structural. Keep in mind that folks don't have to live full-time in an RV to purchase one that is built for full-time use. Theoretically, these brands and models should provide more comfort and even longer wear for less-frequent travelers. They are more sturdy because of stronger/beefier frames, walls, slide-outs, and roofs, among other things. We were very happy to learn about these two companies. We still had a lot of work to do, but with a more narrow focus we could zero in on suitable models much faster. The next step was to research both of these companies. We read as much as we could find about DRV, Carriage, and the various lines of 5th-wheels they currently make -- the history, reputation, and financial strength of the companies; warranty coverage; structural materials and other details about the frame, roof, walls, and slide-outs; standard and optional convenience and comfort features; floor plans; lengths, weights, storage and tank capacities; interior color and furniture choices; levels of luxury (both manufacturers have three major lines of 5th wheels at lower, middle, and higher cost levels). 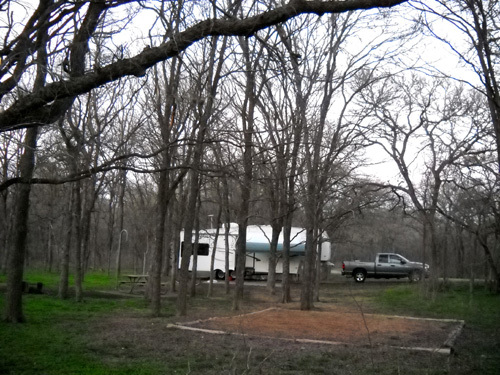 Although neither Carriage nor DRV coaches had been on our radar before, there were five handsome DRV Mobile Suites 5th-wheels in the campground at Fort Sam while we were there. Hit the lottery again! 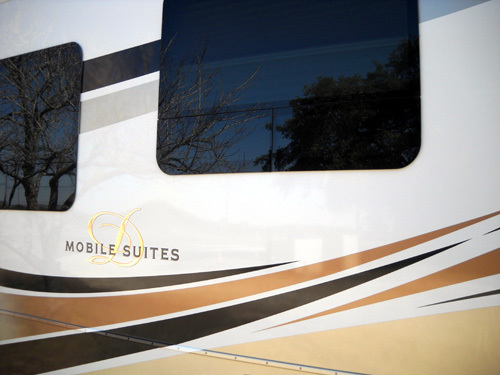 The Mobile Suites line is the middle-level price range for DRV coaches and are the most expensive models we considered. We struck up conversations with two of the owners to determine their level of satisfaction. One of the couples invited us to see the inside of their rig. Although their model is a couple feet longer than what we can tow, and it's several years old, we were impressed by how "homey" it felt. The couple absolutely loves it. They are full-timers. Other Mobile Suites owners we talked with after that were also very pleased, despite some inevitable problems that every new RV owner seems to experience. 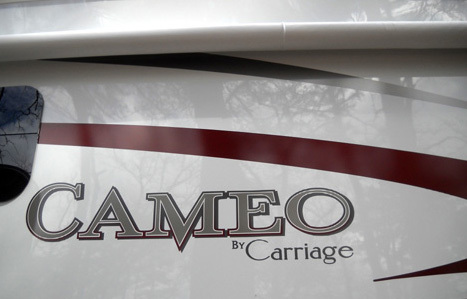 We never ran into anyone in a campground with a Cameo, Carri-Lite, or Royals International (the three price ranges for Carriage 5th-wheels) until we arrived at Huntsville State Park but we were able to see the Cameos and Carri-Lites at several dealers. We decided the Carri-Lites were too fancy for us inside so we concentrated on the more subtle Cameo line. With nine different models at the time, we were plenty busy locating Texas dealers that had the shorter ones in stock (up to 36 feet long and no more than 12,000 pounds dry weight). Another way we used the internet to our advantage was to read several Cameo and Mobile Suite owners' forums and e-lists. Like the ultra list that I often mention, these forums and lists cover a wide variety of topics regarding problems owners have had with their coaches and how they either fixed or resolved them, useful modifications they've made to their coaches, pros and cons of various features, and other helpful information. We also found several website journals and blogs written by full-timers who own Cameos and Mobile Suites and corresponded directly with a few of them. THIS IS SUPPOSED TO BE MORE FUN, ISN'T IT?? Satisfied from our internet research that both companies had the quality we were looking for and a few models about the same size as the HitchHiker, our next step was to find out which dealers in Texas carried which brands and models. All that took time, of course, and we learned more as we went from dealer to dealer, from several in the San Antonio area to points north and east in Texas. We slept in a different town each of the next few nights before finally landing in Huntsville State Park on the 25th. Our search continued from that campground base. And how did that process go?? It was fun at first -- we love looking at new "houses" -- but we inspected so many coaches and drove so many miles to find them that it became less and less fun as time wore on. No dealer had more than two or three models that we had determined were suitable for us but we continued to look at a couple other brands "just in case" we couldn't find a Mobile Suite or Cameo model -- and an accompanying acceptable deal -- that was right for us. Each dealership also took more time because we had someone look over our HitchHiker while we were there in order to determine a trade-in value without us having to haul it back again if we ended up getting a new coach from them. If we were doing this process from our house in Virginia, we would have considered selling the HitchHiker to an individual and not trading it in. That simply wasn't practical for us while on the road. Negotiating prices was not fun. I'll talk more about that in a separate entry as another one of our "cautionary tales." Heck, I could write an entire book on that by now! Dealerships tried every trick in the book to get us to buy, except give us the kind of price we wanted. Perhaps our experience will help other folks who are looking for a new or used RV. Some of the tips apply to any vehicle purchase. However, the industry is just beginning to recover from its worst or second-worst sales period in history. Many RV manufacturers either went out of business, filed for bankruptcy, stopped producing new units, or drastically reduced their new inventory over the past two or three years. 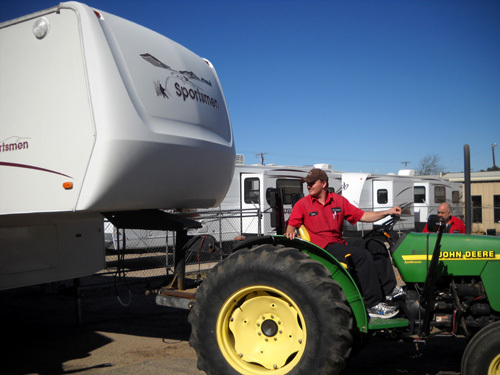 Many RV dealers have also gone out of business or have seen their sales significantly down. The segments of the industry that have stayed healthiest are at the far ends of the bell curve -- the cheapest campers and the most expensive ones (that's also true of other products in a recession or depression). Three feet of snow . . . let's go buy a new RV! This is also the slowest season to sell RVs. Who wants to go buy an RV (or boat or house, for that matter) in the dead of winter, especially a winter that's been as cold an snowy as this one over most of the country? Even southern Texas isn't immune from that mindset. 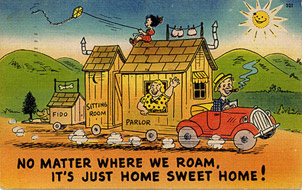 Spring is traditionally when folks get the itch to buy a new RV, boat, or house. So you'd think RV dealers would coddle potential buyers, especially serious ones, in an economic recession/depression like this, but that wasn't our perception at all. Despite their claims of all of us having the same goal -- to get us into the best possible RV fit -- it is an adversarial process by its very nature: dealers want to get the most profit possible and buyers (should) want to get the lowest price possible. And we discovered it can get even dirtier when two dealers within the same ownership are fighting against each other over your business. 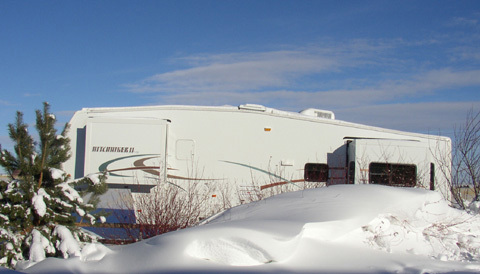 The selection of RVs is more limited now than it was three or four years ago. The same thing is true of the home-building industry: the best way for both industries to stay solvent when demand shrank was to decrease the number of floor plans and number of houses/RVs available and use less expensive materials. It's called "value engineering," becoming more standardized and squeezing costs and labor. That complicated our RV search but it also gave us the potential to get a better deal than if we wait until spring or another year when more buyers come out of the woodwork. We traded quantity of choices for more economy, and we think it eventually worked in our favor. After a lot of work on our part -- and no small measure of angst -- we found a new Carriage Cameo 5th-wheel coach that meets our wants and needs as closely as anything we could find. We are also pleased with the final price we negotiated. Next entry: welcome to Chez Cameo!